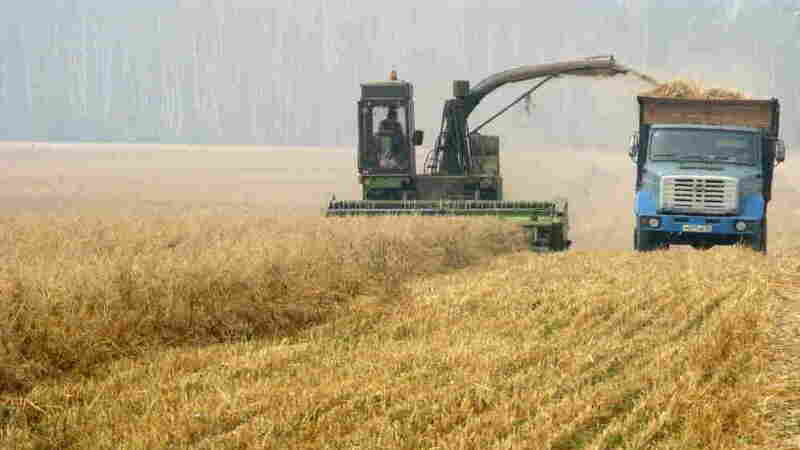 Grainy Season: Engineering Drought-Resistant Wheat Following the summer's drought in Russia that sent wheat prices skyrocketing, scientists are studying ways to make one of the world's most important crops drought-resistant. And creative genetic engineering may hold the answer. Last summer's drought in Russia pushed wheat prices to their highest levels in years, and the fallout is a reminder of how much humanity depends on the rain. Now, scientists are searching for novel approaches to make wheat less vulnerable to drought. Some efforts are trying to replace the genes that made possible the dramatic boost in wheat harvests in the latter half of the 20th century in India known as the Green Revolution. Few people can see the accomplishments of the Green Revolution more clearly than Kulvinder Gill, who grew up in a village in India where, half a century ago, some predicted catastrophe because food production wasn't growing as fast as the population. "It was a common belief that this world is going to end because of the starvation," Gill said. "People are going to fight for food and kill each other." But scientists such as Orville Vogel at Washington State University bred new varieties of wheat that included a mutant gene that kept the plant short. When you gave these plants lots of fertilizer and irrigated them, they didn't just get tall and fall over like ordinary wheat -- they produced more grain. A lot more. "These dwarfing genes came and almost tripled yields, at least in Punjab area," Gill said. So Gill left his village in Punjab and became a wheat geneticist. He now occupies the Orville Vogel Endowed Chair in wheat breeding at Washington State. And he's hoping to not only repeat what Vogel did, but improve on it. That's because the dwarfing genes of the green revolution -- which are now in 90 percent of all the wheat that farmers grow around the world -- have an unfortunate side effect, he says: They make it harder for the plant to thrive when water is scarce. For instance, when it's dry, farmers have to plant seeds deeper because that's where the moisture is. "And these semi-dwarfs don't do too good pushing out of 6 inches of soil," Gill says. So he's now on the hunt for a different and better dwarfing gene. He knows exactly what he's looking for: It's a mutation that already exists in corn and sorghum. It doesn't shrink the whole plant the way the green revolution genes do. Instead, it blocks the normal flow of a crucial growth hormone. "So the plant reduces in height, but at the same time, the cob is bigger, the stem is thicker and stronger, and the plant looks great," Gill says. To create this kind of wheat plant, Gill and a group of collaborators have treated thousands of seeds with a chemical that makes random changes in DNA. Now these mutant wheat plants are growing in the greenhouse, and Gill has to see if any of them have the one change he wants. "It is very difficult to know at this point if the mutant is the one -- the kind we are looking for," he says. Gill's project is just one small part of a global campaign to reprogram crops genetically so they can survive water shortages. People are trying everything from low-tech traditional crop breeding to high-tech gene splicing. One approach, somewhere in the middle, involves looking for useful genes in wheat's ancestors. Scientists are retrieving seeds from the refrigerated vaults of gene banks and taking a fresh look at those plants. Thousands of years ago, three of them somehow combined in the wild to form modern wheat. David Bonnet, a wheat geneticist at the International Maize and Wheat Improvement Center based in Mexico, says scientists can re-create that merger in the laboratory. "So we can go back and bring in more genetic variation for a whole range of traits, but certainly drought tolerance is one of them," Bonnet says. But the approach that's getting most of the attention and most of the money these days is genetic engineering. Agricultural giant Monsanto has inserted a gene from bacteria into corn and it says this variety yields 8 to 10 percent more under drought conditions. The gene is called a transcription factor -- a kind of master gene that activates many others when the plant is under stress. The company says if it gets a green light from regulators, it will start selling the corn within two years. Monsanto has also donated the gene to a group of government-supported research institutions in Africa that are starting greenhouse trials of corn-containing the gene this year. In the scientific community, there's a lot of curiosity about the Monsanto product and some skepticism that it will work as advertised. But many of them, including Mahyco, a leading seed company in India, also are looking for genes to splice into crops. "In our program, we are looking at transcription factors from drought-tolerant crops -- sorghum, acacia trees or other crops that are known to be drought-tolerant," says Usha Zehr, Mahyco's chief technology officer. And geneticist Bonnet says there's no shortage of genes that seem like they might possibly help a plant use water more efficiently. "We have access to quite a lot of candidates ourselves, and we think they have as much or more potential as what Monsanto has," he says. Actually realizing that potential may become increasingly important as the globe warms up. Climate models predict that many parts of the world -- including major crop-growing areas -- will see more droughts in the coming years.